Team Rural Health In-House Pharmacy won the UM on-campus portion of the Blueprint Mississippi Social Business Challenge. The team includes (from left ) Nicholas Keeling, Stephanie Sollis, faculty adviser Erin Holmes, Andrew Smelser and Sonja Falvey. 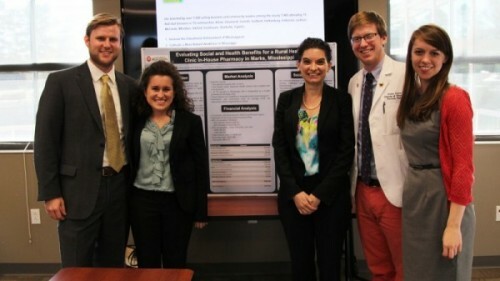 A student team from the University of Mississippi School of Pharmacy is taking its plan to provide rural Mississippians with better access to affordable medications all the way to the finals of a statewide business challenge. 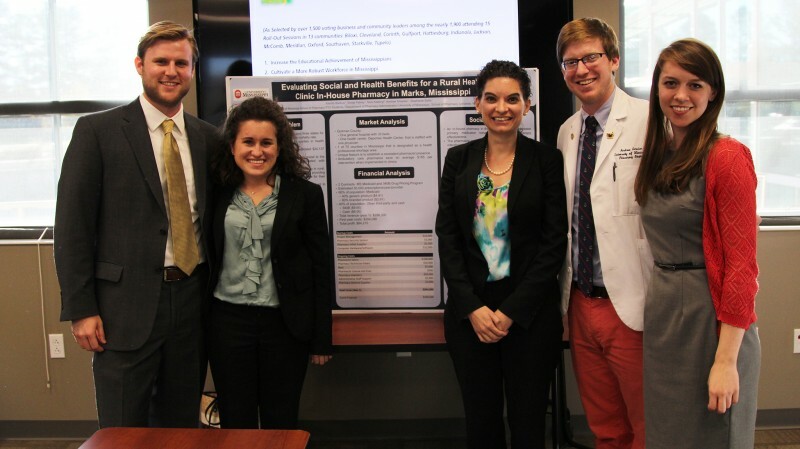 Team “Rural Health Clinic In-House Pharmacy” won first place in the university’s on-campus portion of the Institutions of Higher Learning Blueprint Mississippi Social Business Challenge, conducted Nov. 7. The statewide competition is slated for March 12, 2015 in conjunction with Universities Day at the Capitol. Read the team’s full proposal below. For more information on Blueprint Mississippi Social Business Challenge, visit the website at http://www.mississippi.edu/msbc/. Our business plan seeks to establish in-house pharmacy services within rural health clinics. Establishing in-house discount pharmacies in rural health clinics of this state and others can provide patients immediate access to affordable medications for their chronic conditions and create a lasting relationship between the pharmacist and patient. A pharmacy in a rural health clinic would allow an ambulatory care pharmacist to provide Medication Therapy Management (MTM) and other clinical services to the patient and patient specific medication therapy recommendations to the physician through a Collaborative Practice Agreement (CPA), as well as maximizing effectiveness of therapy and cost savings. A study showed that ambulatory care pharmacists are effective and can save on average $185 per intervention when implemented in clinics. The total savings equated to four times the salary of a pharmacist. This business plan not only benefits ourselves but potentially millions of other lives that could be positively impacted through greater personal health. Basic pharmacy services, such as medication filling, will be provided. The pharmacy will not stock hundreds of drugs that are currently on the market to keep costs at a minimum. It will, instead, focus on those drugs that are more often filled, such as chronic disease medications, antibiotics, and contraceptives. Through a CPA with the physician, the pharmacist will offer diabetes, hyperlipidemia, and hypertension management in order to control these disease states. The pharmacy will also offer MTM to make sure that the patient’s medication regimen is appropriately managed and understood and, therefore, compliance is not an issue. Basic screenings (blood pressure, cholesterol, and blood glucose) as well as vaccinations and proper prenatal care will be offered. Medication and disease counseling, health fairs, community involvement, and patient follow-ups (after visits) will be provided as well. One examining room or other adequate space is acceptable to house shelves for medications, a refrigerator for temperature-controlled medications, and a desk for the pharmacist with sitting space for the patient. This pharmacy would work closely with physicians to provide the best care for patients and build the patient-provider relationships. The market opportunity for our pharmacy business is quite large. Any rural health clinic that does not currently have a pharmacy in-house would be a target. We will focus our initial efforts on areas that have been identified as lacking in health care providers and quality. To inform our population of our establishment, a health fair will be coordinated with the city to demonstrate the services we will be offering and to begin to foster a relationship with the community. The only space need would be one examination room with shelves for medications, a refrigerator for temperature-controlled medications, and a desk for the pharmacist with sitting space for the patient. Revenue streams will come from a variety of sources. Our primary source will be from prescription dispensing services. Based on estimates that a single physician can prescribed approximately 17,000 prescriptions in a year, prescription revenue could be anywhere between $85,000 to $161,000. These figures are dependent on the type of insurance your population has and the reimbursements and dispensing fees (vary by state). We feel as though these are conservative estimates based off of largely government sponsored reimbursement values. Additional revenues will come through MTM services for individuals and employers, transition to care services for local hospitals, and from immunizations for influenza, pneumonia, herpes zoster, and hepatitis for those considered at risk. Occasionally insurers will not provide reimbursement for pharmacist administered vaccinations. For those that do not, the pharmacist and physician could establish a contract by which reimbursement flows through the physician’s contracts but the workload is handled by the pharmacy. This would be an attractive selling point to rural health clinics considering implementing our in-house pharmacy. The ultimate goal for this business is to establish numerous in-house pharmacies in rural health clinics across the nation. We will begin our venture in Mississippi as we know that some of our nation’s worst health outcomes can be found right here at home. However, this idea is quickly adaptable to various situations and types of clinics and we will push to see it expand across the Southeast and further. As our business and revenues grow, economies of scale will provide us with the lower cost and smoother entrance into new markets through increased contracting power.